Back when the British Navy was the finest naval fleet in the world the Revenge was among the famed ships that helped rule the high seas. 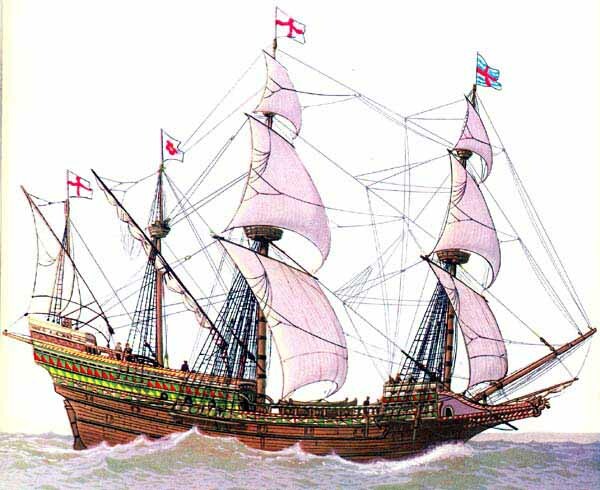 Like all of the British warships of that era, the Revenge was a 500-ton galleon built in 1577 by the leading English shipwright Matthew Baker. With its new "race-built" design, the Revenge was considered among the finest galleons in the world. The high poop deck, a feature of the older galleons, was replaced by a lower series of decks stepped down into the waist of the ship. She had a lower forecastle. This made the Revenge a "long lean fighting machine" of its time. The Revenge was commanded by Sir Francis Drake against the Spanish Armada in 1588. The ship also had a long record of service in Ireland and the West Indies. The ship met its match, however, in 1591 when, under the command of Sir Richard Grenville, she was destroyed in a battle with a Spanish armada in the Azores. This conflict was set up by Admiral John Hawkins, the British naval commander, who established a blockade to stop fleets of Spanish vessels bringing treasure into Spain from America. Revenge was among a number of British ships on patrol that summer. In retaliation, the Spanish dispatched a fleet of 53 ships under the command of Alonso de Bazin. The Spanish plan was to capture the English fleet at Flores in the northern Azores. The arrival of the Spanish armada could not have been better timed. Many of the British ships were moored ashore for maintenance and their crews were recovering from an epidemic of fever that had swept the fleet. Grenville was still at sea with the Revenge although much of his crew was ill. His ship was virtually alone when it met the oncoming Spanish fleet on August 31. In spite of overwhelming odds, the Revenge and its crew put up a fierce fight that continued for 15 hours. The Spanish galleon Ascension and a smaller ship were lost when they collided with each other. The big Spanish galleon San Felipe pulled alongside Revenge and there was a failed attempt to board the English galleon. Seven men of the boarding party died before the San Felipe broke away. Finally the San Cristobal, another large fighting ship, rammed Revenge. This was followed by heavy cannon fire from the San Bernabe. All the while the English crew was returning heavy fire from cannons mounted below deck. The following morning the Revenge was a virtual wreck afloat amid the ships of the Spanish fleet. Her masts were shot away. There was six feet of water in the hold. Only sixteen men out of a crew of 250 were left alive and uninjured. Two of the Spanish ships had grappling hooks attached and the English were now fighting off boarding parties. Grenville, who by now was among the seriously injured, ordered his master gunner to sink the ship rather than let it fall into the hands of the enemy. The officers instead surrendered. Grenville died of his wounds two days later aboard a Spanish warship. The Revenge never reached Spain. A storm that blew up shortly after the battle was over drove the wreck aground off the Island of Terceira. There it broke up. The only thing salvaged were some of the ship’s cannons.